Crate training puppies makes housebreaking much quicker and less messy... and it's easier on everyone too! This page focuses on the 'big picture' and is a 'step-by-step' guide to get your puppy's house-training started off in the right way. It will also help you to avoid the most common pitfalls, problems and questions. There's another page on my site where I've explained why using a crate comes very naturally to your pup and why it isn't scary or unkind. It's important to get your puppy's housebreaking started right away - literally on the first day that you bring him home. This is because puppies are absorbing absolutely everything around them, and they learn amazingly quickly. Which is great when they're learning the stuff you're teaching them - not so great when they're picking up bad habits or figuring out how to do things that you don't want them to do! Dogs are creatures of habit and they learn through repetition. Once they've done something several times it begins to become a habit and after a while it will be instinctive behavior - ie they won't even need to think about it, they'll just DO it. So, that's why it's crucial to make sure your little guy doesn't have the opportunity to make potty-training mistakes. One or two little 'whoopsies' is inevitable during this phase, but regular 'accidents' will quickly become a habit and that's when real problems set in. You've read the page I talked about above, so you know how to introduce your puppy to his crate so now you're ready to actually use it! 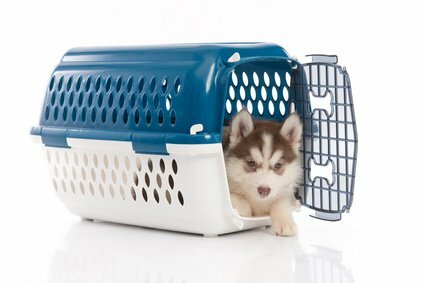 There are several different types of dog crates to choose from. Personally I always use a plastic crate when I'm housetraining a puppy.. for two good reasons. The first is that it's much easier to clean than any other type, and no matter how careful or consistent you are, you will be doing a fair bit of cleaning up during the first couple of days, if not weeks! The second reason is that they're relatively inexpensive and your pup is going to grow out of his first crate (and probably his second one too) pretty quickly. Buying one for him to 'grow into' is not an option with crate training because that will only encourage him to use it as a sleeping spot and toilet area. Picking the right size is crucial! A wire crate would be my second choice. Not as easy to clean, but manageable. You can buy models which come complete with wire divider panels so that you can partition off just a small area for your pup at first, enlarging it as he grows. These are more expensive than plastic models, and not very cost effective unless you buy the divided style. 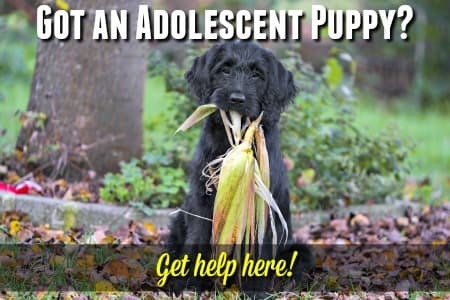 They are great for housebroken adult dogs though. Make sure your pup has been outside to 'do his business' before you crate him, even for short periods. This way when he starts fussing right away you know he doesn't have an urgent need to 'go' and cuts down on the chances he'll eliminate in there. It's a good idea to have a special toy (or two) for your pup to play with only when he's in his crate. Make sure it's something he really likes and is tough and safe (see my Indestructible Dog Toys page for some sturdy toys for puppies who love to chew). These will stave off boredom and help him forget he's not outside running around. During the first few days you can also give him an old T-shirt or something similar that you don't mind getting ruined (it's possible it'll get peed on, pooped on or chewed beyond recognition). Do make sure that there's no buttons, elastic or zippers on whatever piece of clothing you give him and if he does decide he'd rather eat it than sleep on it, take it away. 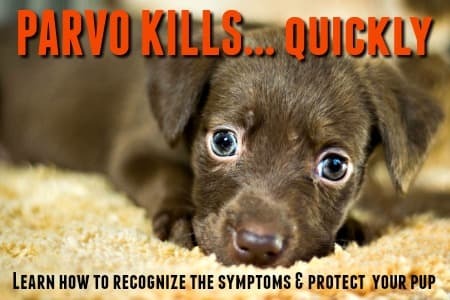 Young puppies want to be with their people at all times and if you disappear from sight the first time he's put in his crate, then your little guy is going to be scared. You don't want him to feel that way so to begin with try to stay in the room, or at the very least within sight of his crate. If you do have to leave the room, try calling to him randomly so that he hears your voice and knows that you haven't deserted him. Crate training puppies is rarely going to be all smooth sailing. Almost all puppies will fuss and cry the first few times. Remember, they want to be right next to you! If you take your pup out as soon he starts whining I can guarantee he'll whine even louder and longer next time. You'll need to start with short periods of crating and work up to longer ones. The rules are a little different when it comes to overnight crating. Try to put your puppy in his crate beside your bed at night, or at least somewhere you can hear him (although you may wish you couldn't hear him at 2am). Remember, he's still a baby and will need to go out to 'potty' at least once during the night. Crate training puppies during the night time is easier if you make sure your little guy has had a potty break and hasn't had access to drinking water after approximately 8pm. That way he'll most likely go to sleep for several hours before needing to go out. Don't ignore his crying at that point as he won't be able to hold it in and if forced to potty in his crate it'll make housebreaking him much more difficult. This stage only lasts a short while and you'll be glad you persevered when you have a clean, housebroken dog. If you have a new puppy and you're working or going to school for long hours, then you'll need to find a way for your pup to get some time out of his crate during the day. Whether for a potty break, some exercise or just some companionship, at least once during the day. Perhaps you can arrange to come home at lunch-time or during a break, or maybe you've got a friend, relative or neighbor who can get into your house and take care of your pup for you. Failing that, you could pay a responsible person, or better still find a petsitter, to take on that role. An 8 - 12 week old puppy simply ISN'T capable of holding his pee or poop for 6 - 8 hours. If you leave him in a crate for that extended amount of time chances are he'll make a mess and this means you'll come home to a puppy who needs a bath, and a crate that needs to be cleaned. Not fun! What's worse, is that once your pup gets into the habit (remember those bad habits!) of messing in his crate then it's no longer a useful tool for housebreaking and the whole potty training situation becomes a lot more challenging! Whether your pup is in his crate for 5 mins or 30, never open the door and let him out while he's crying and complaining. Wait for a lull first or he'll think he's getting out because he's making such a fuss. When it's time for your little guy to come out of his crate open the door and put on his leash without making a big fuss of him. Take him outside right away so he can 'potty' in his usual spot, then it's time for play and lots of loving! If you give him a big welcome the minute his paws hit the kitchen floor it'll make him desperate to get out the whole time he's crated. 4. What If Your Pup Messes In His Crate? Crate training puppies works because dogs are den animals by nature and will try very hard NOT to mess where they sleep. Is he too young (less than 8 weeks old) and has no bladder/bowel control? Did you forget to give him a potty break before you put him in his crate? Did he drink a lot of water immediately before being crated? Did you leave a blanket or soft toys/bedding in there with him? Puppies are much more likely to pee on something soft than they are on the hard, smooth floor of the crate. Could he have canine worms or an upset tummy causing diarrhea, perhaps due to a change in diet or stress? Could he have a medical problem such as a urine infection? If you bought your puppy from a pet shop, or from a backyard-breeder or even a puppy mill (and you won't necessarily KNOW that your pup is coming from those types of places if you're buying from a store, or online) then housebreaking could well be more of a challenge for you both. This is because puppies brought up in those kinds of places are often forced to spend every minute in tiny, dirty crates or pens. If a puppy is brought up in these conditions his natural instincts to be clean are overpowered, and many pet shop or puppy-mill puppies have no problem with messing in their crates. Remember though, it's not his fault. It will take extra time, effort and patience to housebreak puppies like this, but they've already had a horrible start, so stick with it and be understanding of any confusion and difficulties. Always clean the crate thoroughly, so that the scent of his 'accident' doesn't encourage him to get in the habit of re-soiling over and over. The best type of cleaners to use when you're crate training a puppy, are the enzymatic ones, which totally break down and destroy the odors associated with urine, feces and vomit. Natures Miracle Advanced Stain and Odor Remover is the one I would recommend, we use it a lot! Click here to see a full list of the dog urine cleaning products that I personally recommend. If you have a question, chances are someone else has already asked it, so check them out!